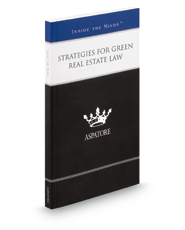 Strategies for Green Real Estate Law provides an authoritative, insider's perspective on helping clients purchase and certify green properties. Experienced partners from law firms across the nation guide the reader through the process of identifying potential risks in contracts and they examine the intricacies of the green real estate market. These top lawyers offer specific advice on understanding evolving green standards, analyzing town- and state-specific regulations, and investigating compliance issues to prevent potential damages. From increasing market value to achieving LEED certification, these experts discuss the need to assess the costs of green property and stress the importance of staying up-to-date on the changes in product sustainability regulations. The different niches represented and the breadth of perspectives presented enable readers to get inside some of the great legal minds of today, as these experienced lawyers offer up their thoughts on the keys to success within this ever-changing legal field.